If you have ever had the joy of watching a child achieve a goal, you’ll understand what happened in Therapy Station #1 this week. Progress is being made and goals are being reached! 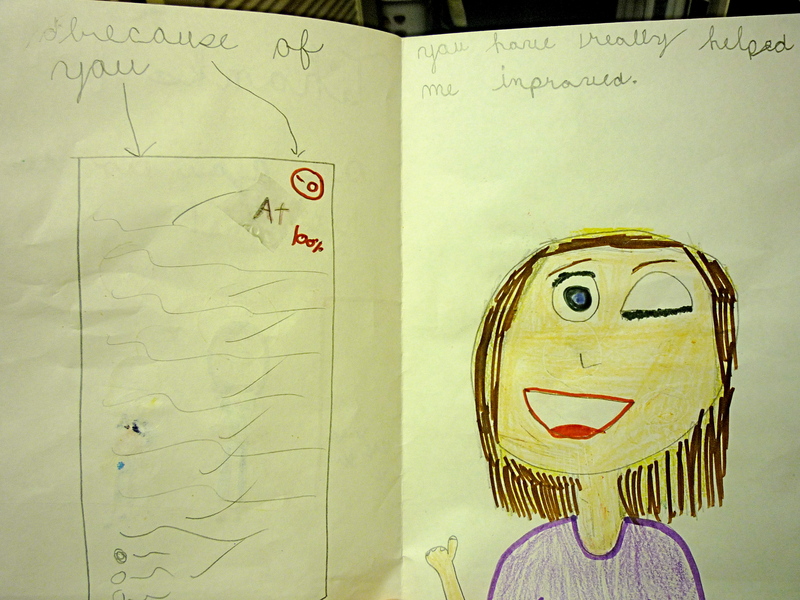 When my student first came to me, she appeared to be a typical, fun-loving fifth grader. However, she was really struggling in school, especially with math. “Katie” was to be moving on to sixth grade the following year, but her parents were concerned about what that meant for her academically. Buzzer technique: Katie has grown in the area of auditory discrimination and memory. She is able to apply learned strategies to find the letters listed on the Morse code page and she rarely struggles to determine whether she heard a long “buzz” or short “buzz”. She is able to “build” words in her head up to eight letters in length. Blue Book technique: Katie is slowly learning to understand and apply spelling patterns. Map Skills technique: When we began this technique, Katie knew very few states and mispronounced several of them. We began with the western United States and have been slowly moving eastward. Her directionality is improving, and she is slowly learning to apply strategies and pronounce states correctly. Dictation and Copy technique: I have seen a great deal of improvement in this area! Katie is consistently using proper paragraph form and proper punctuation. When she began, she was only able to recall a few words at a time and frequently asked me to repeat or told me she didn’t know what I said. Now she is able to recall sentences up to seven or eight words in length. She is improving her visual discrimination by using the finger-to-finger strategy to check for mistakes in her paragraphs. Perhaps the most notable improvement during Dictation and Copy is an increase in her stamina. She is able to maintain focus and push through the difficult parts, rather than getting frustrated and shutting down. Rhythmic Writing technique: Katie still struggles to remember the counts (verbal cues that coordinate with her hand movements) for rhythmic writing, but her form is improving. Her cursive is OUTSTANDING! Each time I meet with her, it seems to get neater and more uniform. When she was asked to write capital and lower case letters during initial testing, nearly all of them were printed, and they were varying sizes. I keep this card on my refrigerator at home. It’s a constant reminder of why I decided to become a therapist. 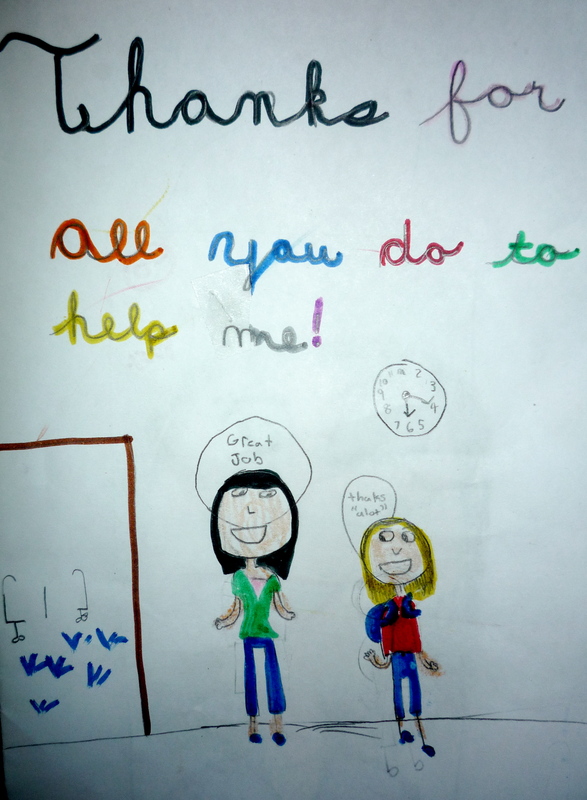 Today, she mentioned that her mom was impressed with how her handwriting has improved. I invited Katie to open her composition book to the beginning, and we marveled at change in her fine motor skills. Math Block technique: One of our big focuses this summer has been fractions. We had to go all the way back to square one, so with the help and guidance of a few seasoned therapists, we did just that. And that brings me to what happened in Therapy Station #1 this week. Not only is Katie adding and subtracting fractions, she is doing it with a great attitude. She lets me know when she doesn’t understand something, and if she gets an answer wrong, she keeps her cool and corrects it. I am so incredibly proud of her! This is a HUGE step for her, since so much of math is built on fractions! I can’t wait to keep you updated on her next big successes! Have your students jumped any great hurdles this summer? Feel free to brag about them! This entry was posted in Uncategorized and tagged exceeding expectations, NILD, reaching goals, student performance, student success, therapist, update. Bookmark the permalink.